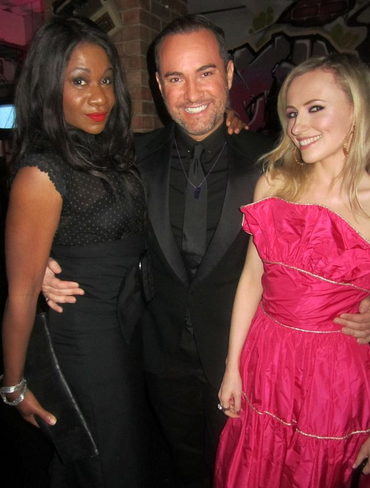 On December 4th TV Presenter, style consultant and media guru Nick Ede held his charity fundraiser ‘A Night with Nick’, in aid of The Stroke Association at Ink London. Nick Ede is the loveliest guy you will ever meet in showbiz. Early on during the evening Nick’s popularity was evident, with a host of famous faces arriving to support the cause and create a buzzing vibe. Guests included Gemma Collins, Dionne Bromfield, Brix Smith Start, Millie Mackintosh, Cheska Hull, Lizzie Cundy, Bobby Sabel, Kristina Rhianoff, Konnie Huq, Lydia Bright, James ‘Arg’ Argent, Densie Welch, Sarah Dunn, Karen Bryson, Petra Bryant and more. Nick looked amazing in a black suit and was all smiles for his beautiful guests. We loved the special drinks served on the night by Hispiritsuk Bong Vodka and Feuillatte champagne. Allumer Jewellery sponsored this special event and cause. It wouldn’t be a party if we didn’t manage to find the photo booth by King of the Booth and we held charity bracelets in the photos to support the cause. Thank you Nick for another amazing event and for supporting this wonderful cause. You are a true gem!